That is the most popular question, by far, I received when people saw the new 6.4-inch Galaxy S10+ I have been testing for the last week and a half. No, this phone is not foldable. But it also doesn't start at nearly $2,000, either, though at around half that price it isn't exactly cheap. While it lacks the flashiness, or risks, of Samsung's forthcoming Galaxy Fold foldable there is still plenty to love in the 10th anniversary Galaxy, which goes on sale alongside its smaller, cheaper S10e and S10 siblings on Friday. Sleek and refined, with the S10+ Samsung has shown just how far it has come in 10 years while giving users who want a more traditional Galaxy plenty to enjoy. Arguably the most notable change on the Galaxy S10 line is Samsung's new "infinity-O" display. 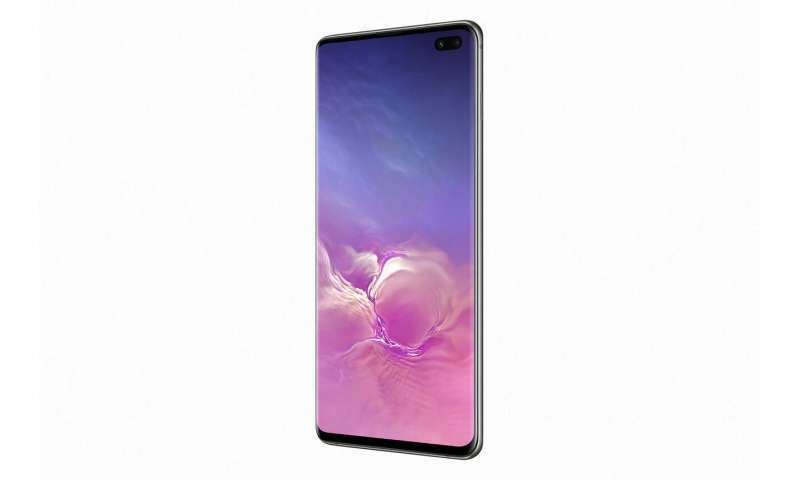 Unlike past Galaxy phones that had bezels along the top and bottom for the front camera, or the iPhone which employs a "notch" along its top, on the Galaxy S10 line the company has instead cut out a little hole in the upper right corner to put its front lenses. The cut-out does take some getting used to and can be a bit distracting at first, particularly when viewing websites or videos with bright backgrounds. As with the notch on the iPhone, however, the cut out does disappear the more you use it. For certain apps, such as Netflix, Twitter and Instagram, the apps do not extend to the entire display by default, stopping just before the cut-out and Android's notification tray. YouTube does take advantage of the full display, which means the cut out does appear in full-screen videos. Those who want a full-screen experience across all their apps can adjust the option in settings. In addition to the redesigned display, the other flashy new feature on the S10+ is its "ultrasonic" fingerprint sensor built underneath the screen. Utilizing soundwaves to identify your finger, the new identification method allows Samsung to bring fingerprint recognition back to the front of the phone after placing it on the rear of the S8 and S9. An icon on the lock screen guides you where to place your finger, while a subtle ripple animation plays when you press down to unlockthe phone. The problem, however, is that the unlock process doesn't always work. An early version of the S10+ software struggled with recognizing my thumb, though a subsequent update Samsung provided last week has improved the sensor's accuracy and speed. Other unlock options are available, including a face unlock setting. Unlike the iPhone's FaceID or prior the iris scanning feature on earlier Galaxy's, however, this version of face unlock doesn't utilize any extra sensors and is not as secure as those aforementioned options. It'll work for quickly unlocking your phone, but you won't be able to authenticate payments using Samsung Pay. One other note: With the fingerprint sensor being in the display, you will want to be careful when buying a screen protector and those who opt for one should make sure it's properly designed. Samsung will include one in the box that is pre-installed on the S10 and S10+, but those who take it off or want to replace it later will want to be mindful of that. Recent Galaxy phones have adopted all-glass designs, giving the phones a premium feel that matches their costly sticker prices. Samsung has stuck to the same idea with the S10 line, leading to a phone that looks and feels great—and still keeps water resistance and the standard 3.5mm headphone jack—but one that is a bit slippery, particularly at this larger size. While it never fell out of my hands, those who are prone to dropping phones will be best off grabbing a case. With five camera sensors, two on the front and three on the back, the S10+ continues its battle with Apple and Google on camera dominance. The S10+ doesn't outshine the Pixel or latest iPhones in every aspect, but it does represent Samsung well. Images captured on both the front and rear lenses were crisp, with notable improvements to the front and rear portrait features which Samsung calls "live focus." The new ultra-wide sensor on the S10 and S10+ is also a welcome addition, allowing for an additional perspective beyond the standard wide angle and zoom lenses found on other devices including last year's S9+. Low light shots were fine, though Google's Pixel still leads the pack there. I also prefer the iPhone's portrait mode, though the S10's "color point" effect where the background is black and white while the subject is in color, quickly became my go-to for taking pictures of my newborn nephew. Although Samsung has had a mixed history with software tweaks to the camera—I still don't think AR Emoji are particularly useful—I actually enjoyed having the phone's "shot suggestions" feature turned on to help make sure subjects are properly focused and the image is straight. A new video stabilization feature called "super steady" helps reduce shakes from appearing in your finished films. While the feature was useful for recording multiple minutes of video, when shooting in this mode you do lose the ability to zoom or utilize the multiple lenses of the S10+. Though I never did a "formal" battery test, the S10+ was more than capable of lasting a full day on a charge even while mixing in Spotify streaming, YouTube and Netflix watching as well as playing a few various Android games. A new battery feature called "Wireless PowerShare" lets you turn the phone into a wireless charger for other devices, allowing me to give juice to an iPhone X and Samsung's new Galaxy Buds earbuds just by placing either device on the center of the S10+. While useful, don't expect fast wireless charging: Roughly 20 minutes of charging a friend's Galaxy S8 gave him only an extra 4 percent of battery life. One other note: You will need to make sure the S10+ has over 30 percent of battery left to use the feature. The performance was similarly snappy, with apps opening up quickly and no lag jumping between them or while playing games. Samsung's Galaxy S line has certainly had its fair share of growing pains through the years. From the blocky, plastic designs of the earlier S line to the software gimmicks of its TouchWiz user interface, it wasn't always smooth sailing for the iconic, popular smartphone brand. And while the S10+ leaves some room for improvement—I mostly avoided using the Bixby digital assistant, which still pales next to Google's Assistant—the phone's pros greatly outweigh its cons, particularly for those upgrading from older Android phones like the Galaxy S8. The excitement may be for the Fold, but those looking for an all-around great Galaxy will still find it in the excellent S10+.